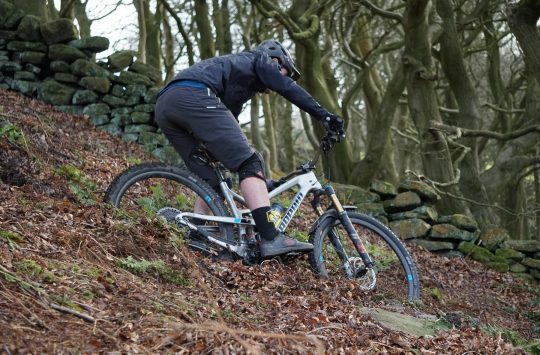 Say you want a mountain bike. 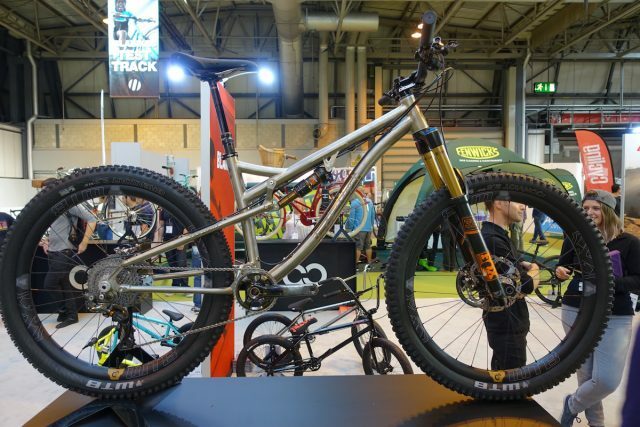 But normal mountain bikes from normal mountain bike brands bore you to death. You detest seeing the same bike over-and-over at every trail head you visit. The same colours, the same build kits, the same bike underneath zillions of riders all around the country. You don’t want the same bike that a zillion other people are riding. You want something different. Something exotic. Something that stands apart from the rest. And you want something that’s likely to outlast religion. 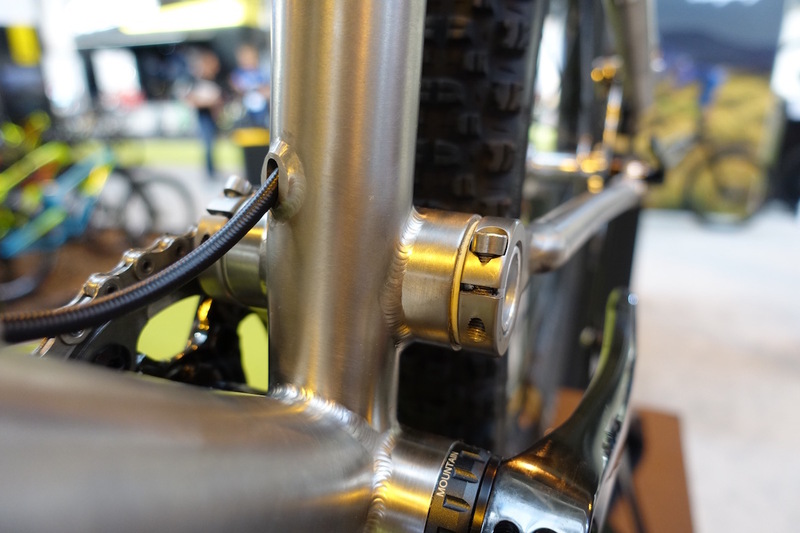 Well, we surely have found the bike for your needs: the titanium Summit 140 from Lynskey! 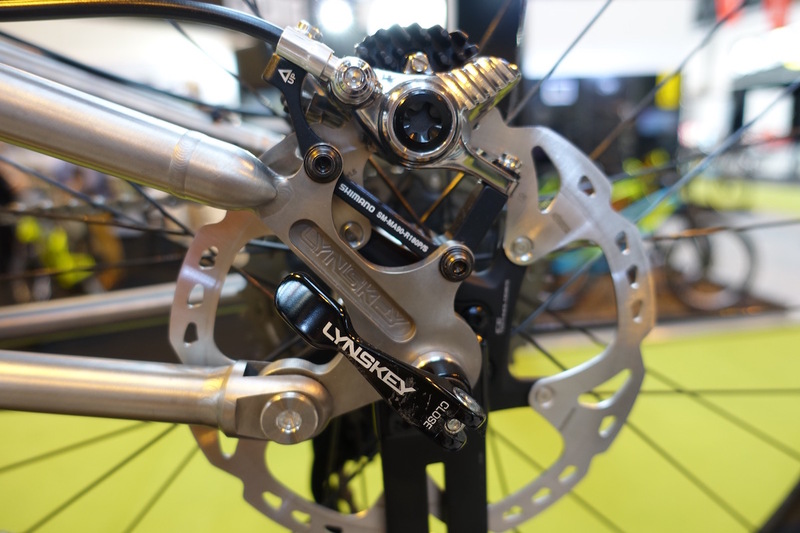 This is the Summit 140 from US-based bicycle manufacturer Lynskey. 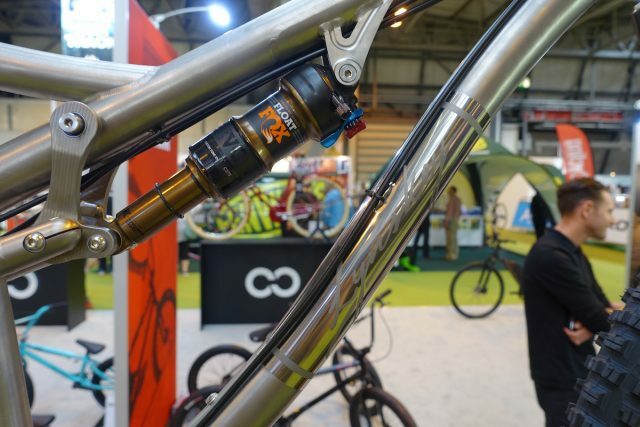 It’s available in both 27.5in and 29in wheel sizes, depending on your flavour. 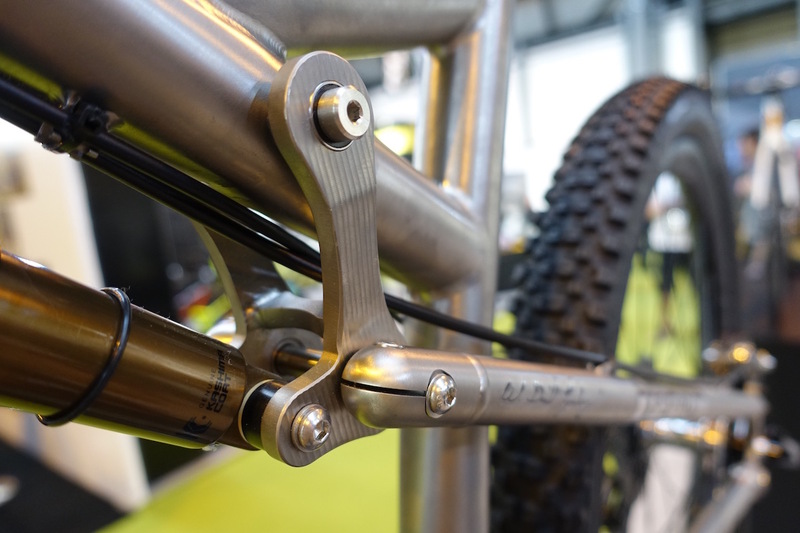 Head angle for the 27.5in model pictured here is 67-degrees with a 150mm travel fork. Max tyre clearance is 2.5in. 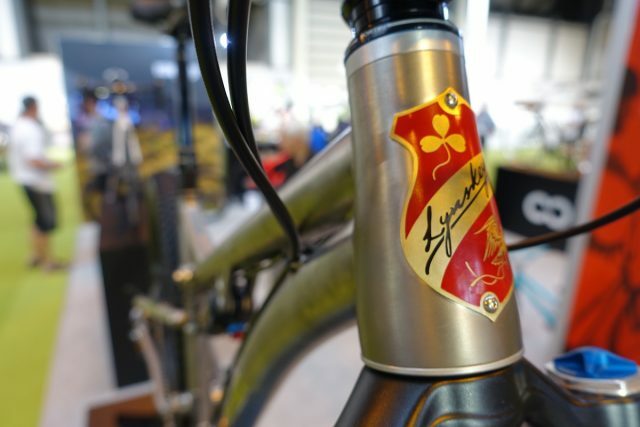 Like all Lynskey’s, the Summit 140 proudly wears a proper head tube badge. 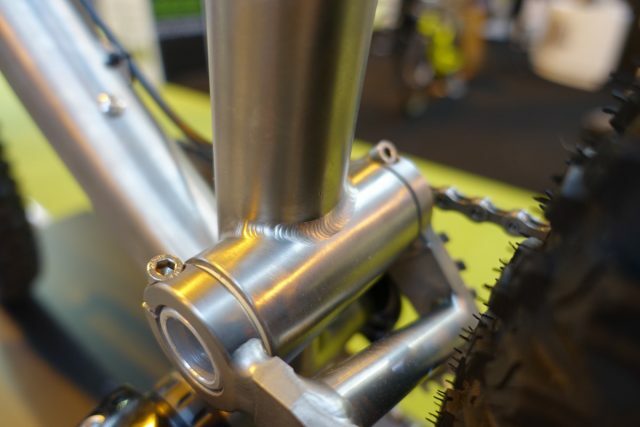 No painted rubbish here on this gorgeous tapered head tube. 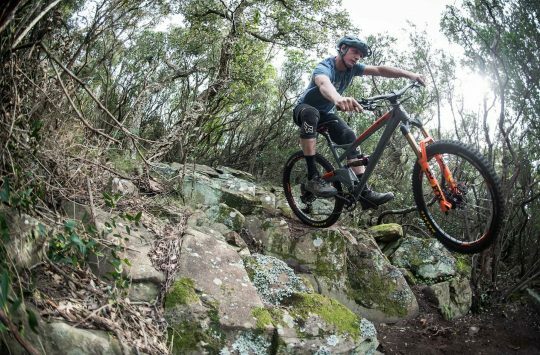 As the name suggests, the Summit 140 offers 140mm of travel out back, and you can fit a 140-150mm travel fork on the front. The suspension design is a four-bar arrangement that updates over the previous bike’s design, which featured a pivot-less rear triangle that flexed throughout the travel. Instead, the new Summit 140 uses a horst link pivot on the chainstay, which will likely offer a smoother feel throughout the 140mm travel. 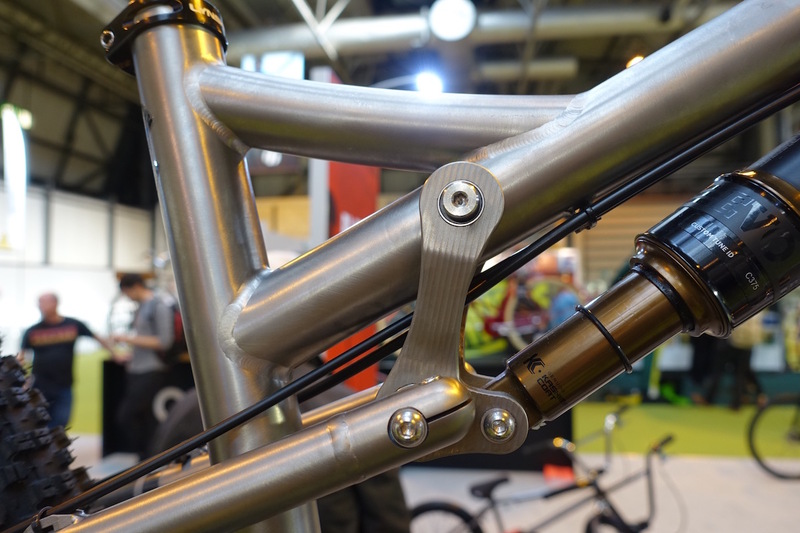 148x12mm thru-axle on the back, with neatly machined dropouts. 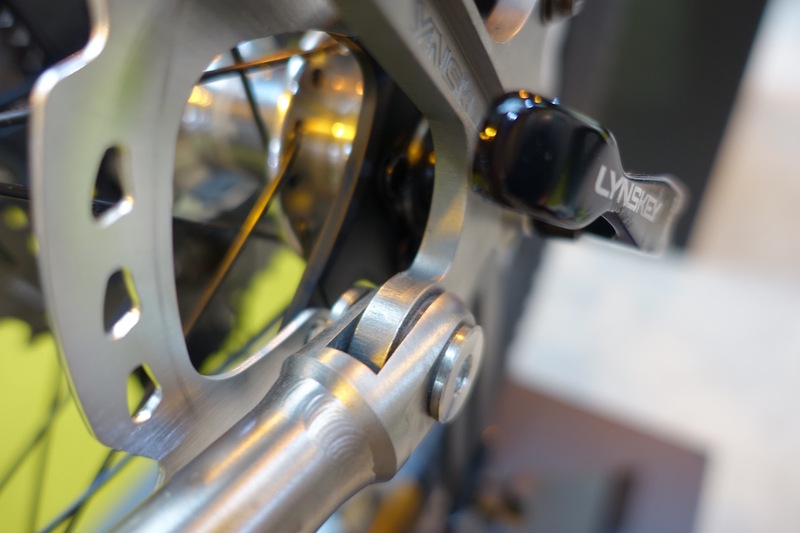 The rear shock is driven by a pair of titanium plates that connect the swingarm to the front triangle. Clean cable routing too. Interestingly, the Summit 140 features an enormous bushing for its main pivot, rather than sealed bearings like the rest of the pivots. 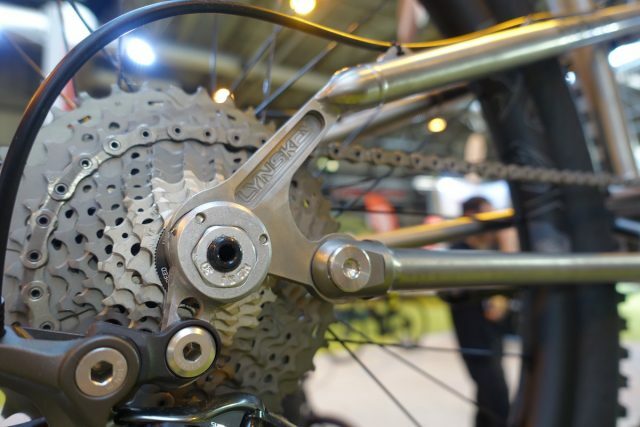 The previous Summit 140 used a Shimano bottom bracket bearing for its main pivot, which was located forward of the BB shell on the downtube. With the updated suspension design, Lynskey has moved the main pivot to sit above the BB shell on the seat tube. All cables run externally, except for the Stealth dropper post line. 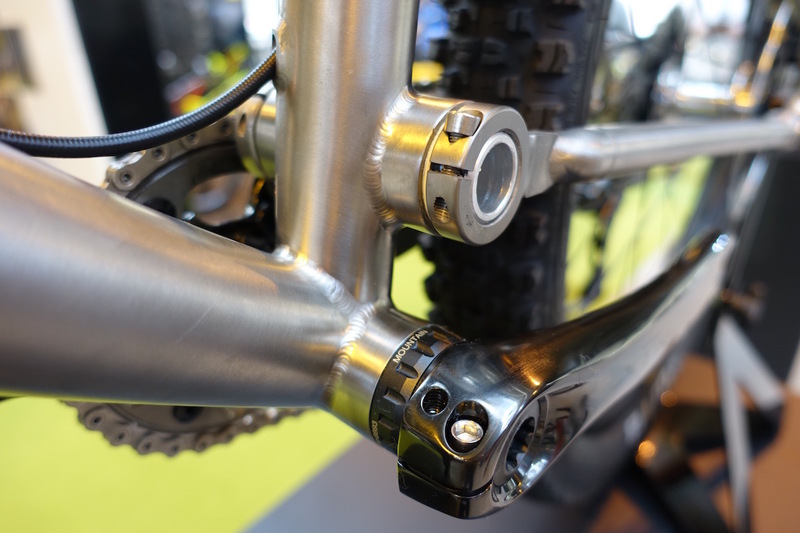 A hollow alloy axle slides through the large main pivot bushing, with the swingarm using two pinch bolts to lock it down over the alloy axle. 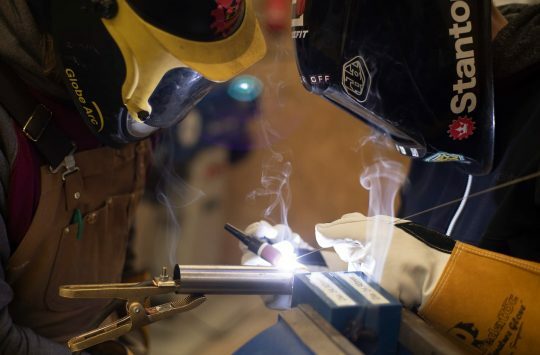 Lots of lovely details and welding abound on the Summit 140. And just in case you didn’t know what brand of bike you were riding, Lyskey have kindly etched the name into both dropouts. Absolutely love the rounded ends of the upper seat stay assembly. Isn’t that gorgeous?? 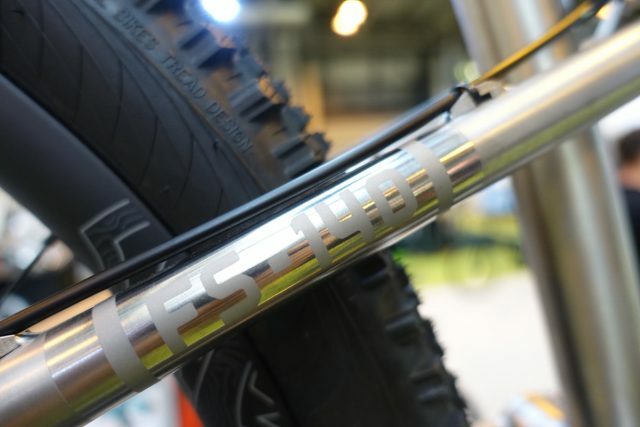 A Lynskey Summit 140 will set you back £2099 for the frame and Fox Factory FLOAT rear shock. 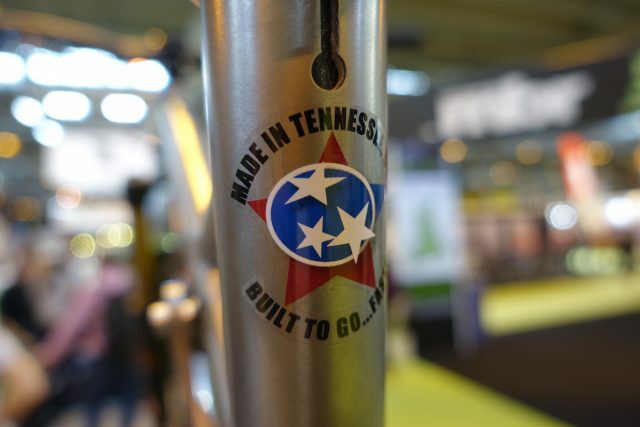 As with every Lynskey, the sky is the limit however, with a whole heap of options for you to customise your new bike as you wish. 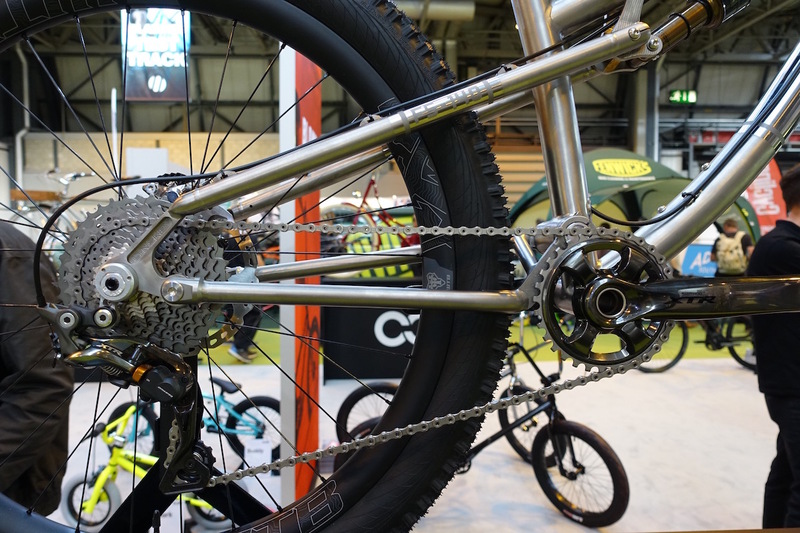 The polished finish featured on this display bike is available as an upgrade that will cost you …*gulp*…£1000 on top. Well, as they say, YOLO! Born in the USA baby! “Something that’s likely to outlast religion”. You MUST be talking about a different bike/manufacturer. I’d be impressed if it lasted the length of prayer sermon. Very pretty, but I just can’t see those pivots lasting in the Quantocks grit.